Working through our partner, the Borneo Orangutan Survival Foundation (BOSF), Fauna & Flora International has now helped facilitate the reintroduction of three groups of Bornean orang-utans into protected forest areas in Central Kalimantan. The third group, comprising eight orang-utans, joined the 15 primates already released in 2012. So far the successful reintroductions have provided previously unrecorded scientific data that will aid scientists in planning future reintroductions for orang-utans and other large primate species. The eight release candidates departed from the Nyaru Menteng Orang-utan Reintroduction Programme to Tjilik Riwut Airport where they were transported by airplane to Puruk Cahu. After a nights rest in the transitory enclosures constructed in the area of PT Indo Muro Kencana, the group were transported to Bukit Batikap Protected Forest by helicopter, and were released on the same day. This release is contributing towards the goal of seeing all rescued orang-utans reintroduced back into the wild by 2015. The plan, announced by the President of the Republic of Indonesia during the Climate Change Conference in Bali in 2007, relies on suitable forest conditions, one of the primary aspects involved in the decade of planning for these releases. 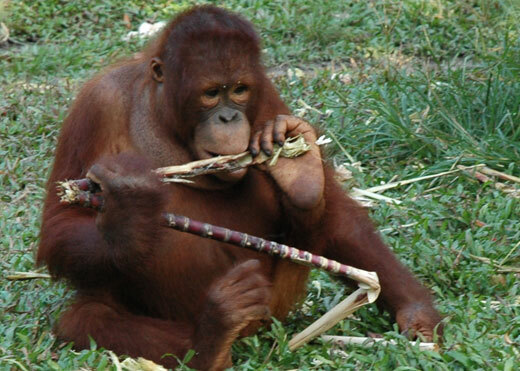 All released orang-utans will be monitored for at least one year to ensure their ability to adapt to their new home. Approximately 600 orang-utans are still awaiting release from the Nyaru Menteng Orang-utan Reintroduction Programme. After many years working in media management and PR, Ally ran a boutique arts and entertainment publicity agency with a client list that included comedians Eddie Izzard, Stewart Lee, Ed Byrne, Wil Anderson, Adam Hills and Rove McManus. Ally was Publicity Manager of the Melbourne International Arts Festival from 2002 to 2004 under Artistic Director Robyn Archer, before moving into strategy and communications for conservation organisation Greening Australia, sparking her interest in all things environmental. From there she moved to television production company Roving Enterprises, as Unit and Company Publicist and was introduced to FFI upon their arrival in Australia in 2008, becoming a board member until June 2010, when she took on a more permanent role within the organisation. To visit the website of Fauna & Flora International, click here. Assam, in the northeastern corner of India, was hit in July by the worst floods in a decade, affecting 2800 villages and more than two million people. The flooding of the Brahmaputra River killed over a hundred people and also killed many wild animals in the Kaziranga National Park. There is a scarcity of fodder for the cows, and the people, who have lost most of their belongings, are unable to feed them. Some cattle were washed away in the floods; the surviving cattle are also suffering from flood-caused diseases. 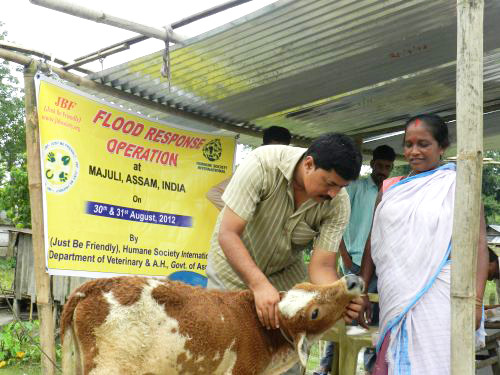 On August 30 and 31, the group Just Be Friendly, in association with Humane Society International, carried out a two-day relief campaign, “Post Flood Response Operation,” on the island of Majuli, educating people about the effects of the floods on cattle and distributing free medicine to treat the cows. Mujuli is the world’s largest river island. Leaving from Guwahati City, before dawn at 5 am, the team, consisting of the team leader, three vets, and two animal handlers, in a truck packed with supplies and medicines, crossed the Brahmaputra on a ferry. They notified authorities in Jorhat about their work, and held a meeting with the Majuli Veterinary Department as soon as they arrived, then split into three groups to conduct camps in three different locations on the island. The three teams found that many of the roads were washed out. Muddy, nearly impassable stretches made traveling tough and hazardous. At the first camp, held at the village of Karatipar (20 kilometers or 12 miles from base camp), they held a gathering, explaining to people the nature of the cattle diseases and the treatments that would help the cattle, and distributed medicines for 3,000 cows and buffalos. 25 kilometers (15 miles) from base camp, the second camp was held for another 3,000 animals at Salmara and Basamora. The third camp, held for 1500 animals, took place at Sonowal and Kachari villages, 45 kilometers (27 miles) from base camp. The next day they got an even earlier start, at 3 am. Twenty team members, with all their supplies, got into a small motor boat called a “bhutbhuti” and headed for a sandbar where they would hold a gathering. However, the water was full of obstacles. After half an hour making their way through the debris, they arrived and were struck to see 5,000 cows roaming about on the sandbar. They held the awareness camp and distributed the medicines. The Veterinary Department of Majuli had also brought along medicines to hand out. The people, who were struggling with their losses, were having a hard time coping with caring for the cows and most had little idea what to do. Simple instructions and guidelines, given along with medicines and food supplements, offered people a handle on where to start and how to help the animals. Everyone was grateful and very attentive. Finished by noon, the team left, and in the afternoon, on their way back, met with authorities in Jorhat, reporting that all had gone well. The team members’ hard work and dedication meant that many thousands of cattle who might otherwise have succumbed to disease, will now have a much easier time staying well and recovering from the floods. Dr. Sashanka Sekhar Dutta, of JBF, expressed his heartfelt thanks for the financial support and coordination of Humane Society International and for the teamwork of everyone involved; the Veterinary Departments of the Jorhat District and the Government of Assam, local vets and their assistants, and many volunteers from Majuli. It was a great start, but much more remains to be done, and the cows of Majuli will need continuing food and vet care in the weeks ahead. If you’d like to donate to help with the relief work of Just Be Friendly. Click here. 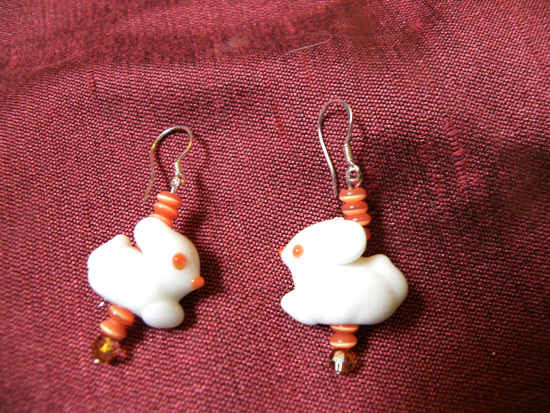 Lisa ships internationally, and will donate 20% of the purchase price to Humane Society International. 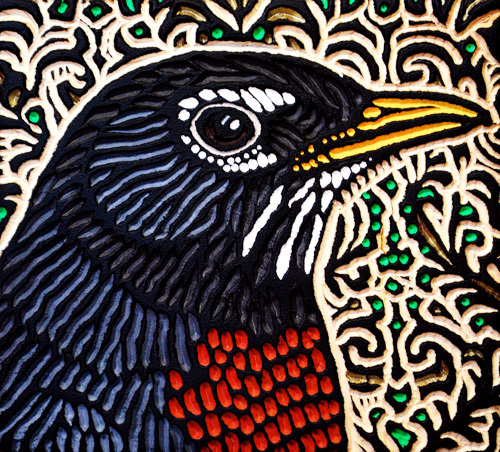 To see many more beautiful wild birds and other woodcuts that she has done, click here. 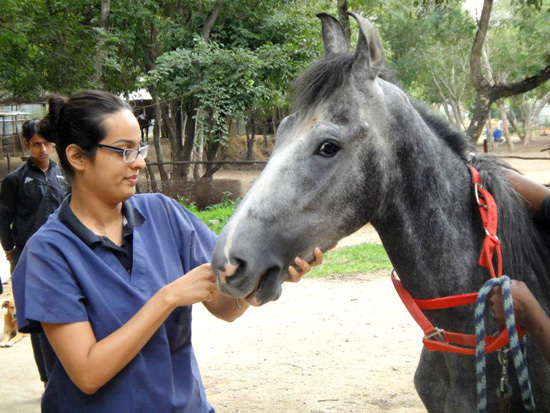 On August 18, 2012, Dr. Akruti Choksi donated an entire day of her expert services as an equine dentist to assist the horses being cared for by Samabhava, in Bangalore. She also donated her time earlier this year in March. A horse’s teeth affect the entire health of the horse, so dentals are really important for overall good health. Samabhava provides vet care to many working horses and gives shelter, along with good food and care, to several rescued horses. To find Samabhava on Facebook. Click here. 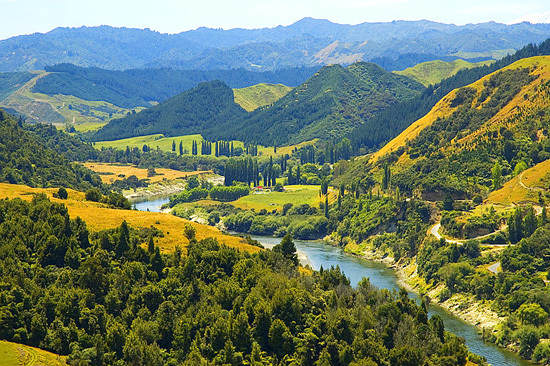 On August 30, 2012, the New Zealand Herald, in an article by Kate Shuttleworth, reported that the Whanganui River has been granted legal status. This is believed to be the first time anywhere in the world that a river has been given such status. The iwi, who are Maori people, have signed an agreement with the government, which recognizes the river legally as a person. On September 10, 2012, WildEarth Guardians and partners filed papers initiating our lawsuit to overturn a decision by the U.S. 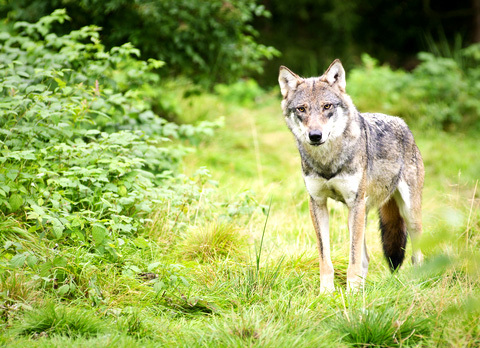 Fish and Wildlife Service to remove wolves in Wyoming from the Endangered Species Act. It’s the last option we have to prevent the slaughter of Wyoming’s wolves. Please support our Wolf Legal Defense Fund (see the link below) to help us stop the killing. If the Service’s decision is allowed to stand, people in Wyoming could trap, hunt, bait and pursue wolves to their death throughout most of the state. And it all starts in a few weeks. We simply can’t allow this to happen. We need to reverse the decision and return wolves in Wyoming to federal protection. Your support of our Wolf Legal Defense Fund will enable us to take swift and strong action to save wolves. The Wyoming “wolf elimination plan” allows wolf killing every day of the year in over 80 percent of the state. Many of Wyoming’s current population of approximately 330 wolves will die this winter unless we strike down this plan. The state intends to allow only 100 wolves to survive outside of Yellowstone National Park and the Wind River Reservation, but it has no way of tracking wolf numbers. Wyoming’s wolf plan is driven by politics, not science. Interior Secretary Ken Salazar approved the plan to appease his friends in the Congressional Cowboy Caucus. It’s not about livestock. Less than one half of one percent of livestock are killed by wolves. It’s not about hunting elk. Wyoming’s elk population is 24 percent over its objective of 85,000 animals. The 2010 count reported 104,000 elk in the state. It’s about intolerance and hate. We must stand up to a small minority that want to eliminate wolves. We must ensure that an ethic of compassion and coexistence ultimately prevails. Our first step is to defend these beautiful animals in the court of law and in the court of public opinion. Please help us prevent the Wyoming wolf slaughter by supporting our Wolf Legal Defense Fund today. To visit the web page Wolf Legal Defense Fund, click here.